Proximity is a very subjective thing. I’m not much a fan of being in close proximity to people, especially those I do not know, those who have offensive body odor, or those who are creepy and remind me of people who would drive windowless vans asking kids to help them find their puppy. Some people do not understand the concept of proximity. They think whatever works for them will automatically work for me. Sometimes, I’ll be in a store and someone will walk up thisclose to me, reaching all over me for different things in the dollar bins or hop onto my back for a piggy-back ride while we’re waiting in line. Usually I purposefully forget to leave my “Yes, I’m okay with you sitting on my lap in public you freaky stranger” sign at home, so I wonder why these people think this is okay. I don’t want to seem totally judgmental, but I probably wouldn’t mind as much if these people were, you know, kind of good looking. Think about it: if some haggard, frumpy looking girl was reaching all over you for one dollar sprinkles and rubbing her womanly parts all over your back while you were in line, you’d obviously be a little freaked out… or maybe not, I can’t assume anything. Maybe you’re into that. I don’t know. But if a nicer looking girl, maybe one who smells like an inoffensive perfume were to, say, sidle up to your side and begin conversation with her face inches from your own, it wouldn’t be as bad… unless she has dragon breath, in which case, I apologize, but that is unforgivable. No one should ever, ever have bad breath. Have you seen the end caps in grocery store lines? Chock full of mints. Gum. Strips. Sprays. And there’s this thing called toothpaste, so really, there are zero excuses for punishing your teeth and tongue and other people by your stinky mouth. Either way, some people don’t understand the whole closeness thing, and it’s kind of awkward to bring up. Usually, when people get a leeettle too close for comfort, I’ll gently step back or away in a not-too-obvious way, hoping they get the hint. Some do. However, some do not. And those people should be punished. In most of my classes, I sit in the second seat (first seat is too eager, and anything in the back has a potential of falling asleep/texting uncontrollably/leaving the class thinking “wtf did I just learn for 90 minutes?”). Because I’m a second seater, I always pull the first desk up a couple inches, then move up my seat a few, ensuring there is PLENTY of space between all three of our desks. I know, I’m really considerate. And in most classes, this has proved to be successful. The people behind me don’t knock their knees against my chair legs, resulting in that oh-so-annoying shaky note-taking, and I don’t disturb my front desk person with my ever shifting crossing legs. The world works well this way. But I have one class where I am consistently bombarded with proximity challenged folk who do not understand the concept of personal space. The third desk person in my row consistently outstretches his putty-like arms and legs, so I’ll occasionally look down at my backpack and discover a dirty sneaker inches from my designer handbag…which is weird, since I always leave like, a foot distance between our desks since he’s becoming a repeat offender. In the same class, I have shared one (ONE!!!) conversation with a particular individual who has decided that our single conversation must mean we’re BFF’s and that it’s totally okay if he like, invades my personal space whenever possible. Put together in a group? Great! I’ll basically SIT ON HER LAP. Spot her alone at lunch? Awesome! I’ll happily annoy the living sh*t out of her while she’s doing math, because staring at a page of viciously highlighted notes about polynomials can’t mean she’s actually working. And what do you say to these people when they’ve become so offensive? Sorry, the lap dog position has been filled–by an actual dog. Can you like, leavemethehellalone? It’s not that I’m unfriendly. It’s just that I have a very large personal space bubble for a reason. A) it prevents me from contracting infectious diseases (I ensure it’s large enough that coughs, sneezes and gross, obviously sick people do not interfere in it); B) it protects me from unwanted attention, either from horndog boys, or the creepy girl at McDonald’s who has an obvious crush on me (so says my boyfriend, anyway); and C) anyone else I deem unacceptable to get too close to me. Maybe I should get a legitimate bubble to surround myself in? Or when someone comes too close, scream “PERSONAL BUBBLE INVASION!!! !” like a maniac and hope they’ll back off at the sight of a girl freakishly screaming obscenities. Or maybe they’re into that. You never know with people these days. 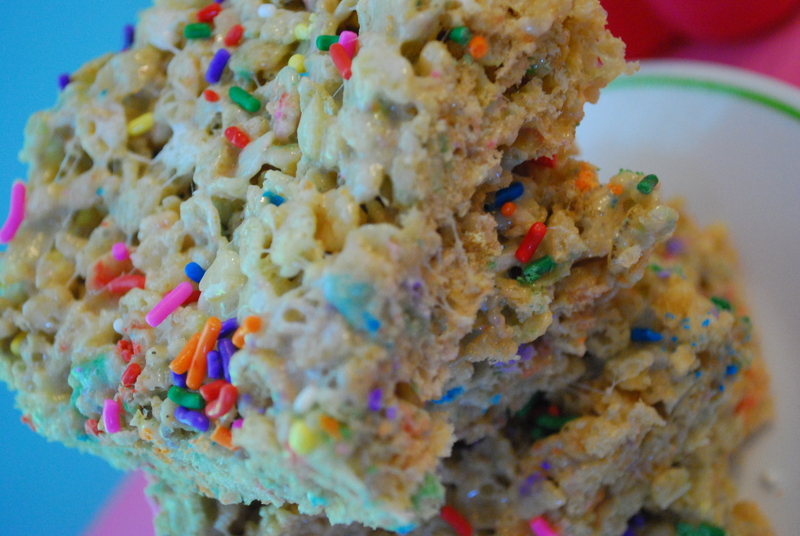 To avoid large hamster wheel bubbles and being kicked out of class from screaming, I decided that maybe I should just make these Cake Batter Krispy Treats to throw at people to divert their attention to something far more interesting and delicious. 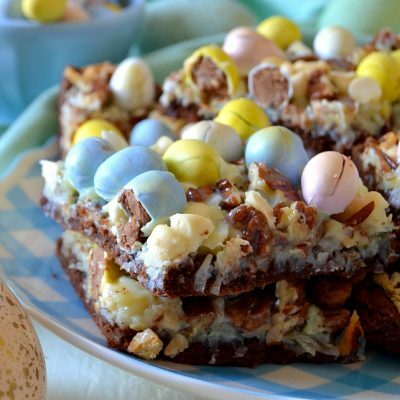 While I’d love to hoard these for myself, I find they are easily attractive to others–the pan was devoured in minutes from my family, who must have like, super sugar senses or something, considering I said NOTHING about the pan of sprinkled goodness in my kitchen and it was inhaled. See? 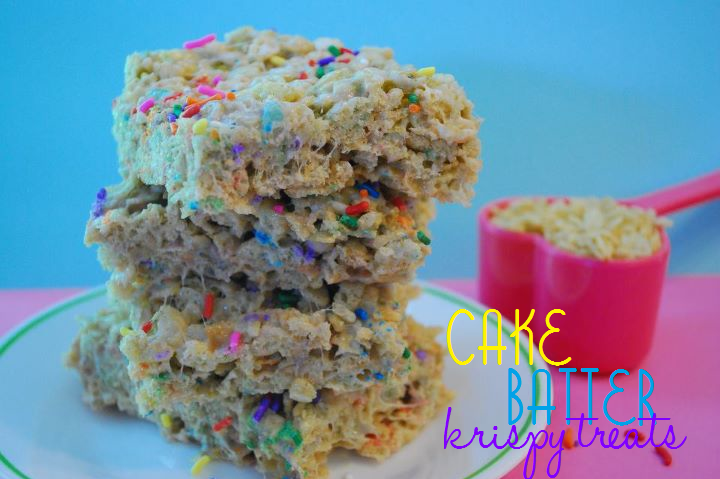 These krispy treats will SAVE YOUR LIFE. 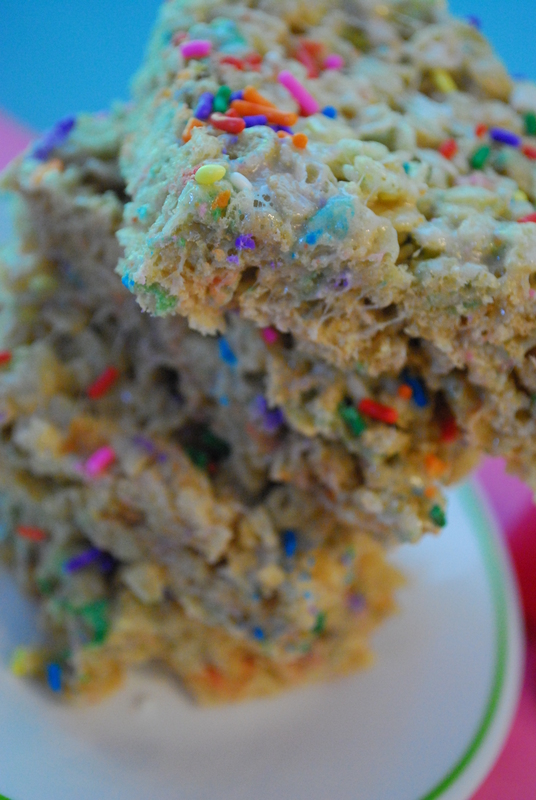 Cake Batter Krispy Treats *from Jessica’s amazing recipe at How Sweet It Is! 1. Lightly grease a 13×9 inch baking pan with cooking spray; set aside. Put your cereal in a large bowl, and set aside. 2. In a medium/large saucepan, melt butter and marshmallows over medium heat, stirring constantly, until marshmallows begin to melt. Gradually add cake mix, one spoonful at a time, stirring to combine. Once cake mix is completely added and mixture is melted (all marshmallows are melted), pour hot mixture into the bowl with the cereal, tossing cereal and mixture to coat completely. Add half of the sprinkles (1/2 cup). 3. Spread mixture into your prepared pan, creating an even layer. I find it’s easiest to use a rubber spatula that’s been sprayed with cooking spray–prevents sticking. 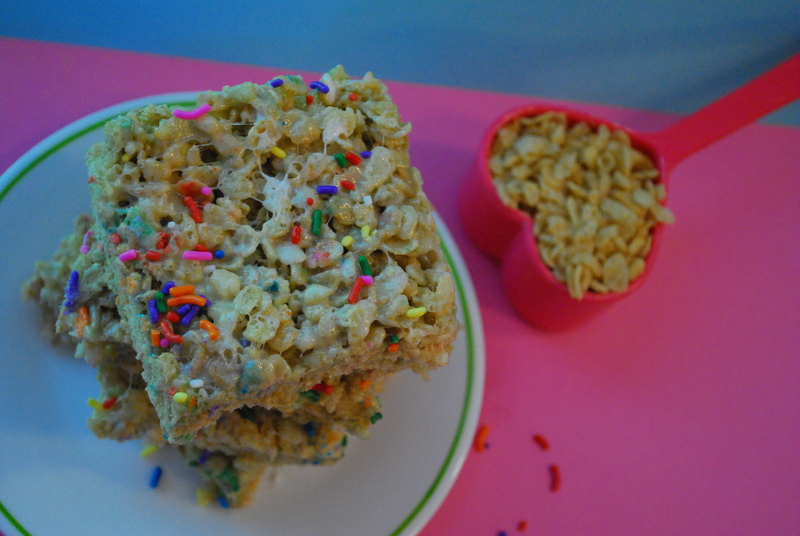 Once your mixture is in the pan, sprinkle the top with your remaining rainbow sprinkles. 4. Allow treats to cool completely, about 1 hour. Cut into squares and serve. Store airtight. *Using this amount of cake mix provides a subtle cake batter taste to these treats. If you’d prefer something stronger, increase your amount to 1/2 cup and experiment with more or less. Also, try using Funfetti cake mix instead of yellow. I’m glad I got to enjoy one of these before my family swarmed in on them like vultures. Is it bad that I’ve addicted them silly to my creations? Is it bad that I don’t really care? I’m evil. Know what else is evil? Not making these. It’s be unforgivable. Pretty much the equivalent of having dragon breath. A huge no-no! Stay tuned! My video (and an original recreation of a childhood classic treat!) is going to be posted SOON! 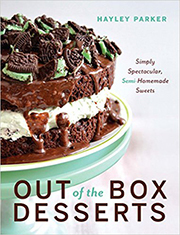 You had me at ‘cupcake’ , and ‘rebel’, and your narrative is great even without the recipes. But I have to ‘follow’ anything rice crispy bar-ish ! Awesome!! Thank you very much for stopping by; let me know how you like these, because they’re wonderful! xo. How long do you bake for, or is it the same as regular rice crispy treats? These are amazing, I am surprised at how fast they went on Christmas day with my family! Hey Chrisaliah, store-bought kinds aren’t nearly as good! 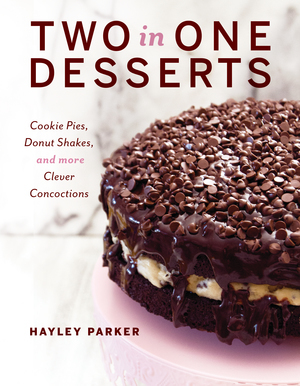 You can continue to add more of that cake batter into the mix to amp it up, or try adding in a splash of vanilla and a little hint of almond extract–it makes it taste more authentic, too! !